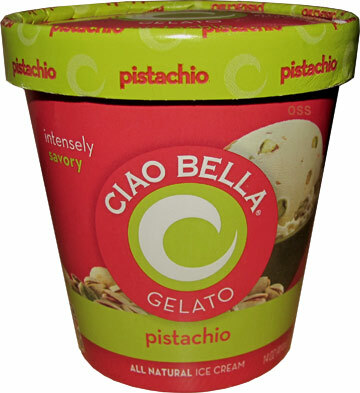 [By Nick, reformulated in 2014] After covering two of Ciao Bella’s base only offerings, it’s time to take a look at a flavor that has mix-ins, pistachios to be exact. Now I’m going to be up front here, I’ve never had a single pistachio in my life. I think it has to do with the fact that I was averse to trying both oddly green colored foods and plain nuts when I was little. Now that I’m older, my aversion is gone but I just haven't gotten around to tying pistachios, even with Psy promoting them. That’s all about to change though so let’s get to it! Ciao Bella simply describes their Pistachio gelato as “intensely savory and silky smooth.” While I can get behind the latter statement, I don’t think I’ve ever heard of an ice cream being described as savory. Well this isn’t quite as green as I was expecting. It’s more of a white that has some green hue to it. Well looks like it’s time to wreck my no-pistachio streak, here goes nothing... Okay, this stuff is awesome. Wait, I’m getting ahead of myself. The texture holds true to the description of being silky smooth but it’s the flavor that has won me over. This literally reminds me of these cookies my grandma used to buy for me when I was little. I haven’t had those cookies in ages nor do I know what they were but this gelato tastes exactly like them. Technically it’s not what I would call savory, instead there are more notes of butter that have been sweetened perfectly. I’d say it’s more like a very sweet shortbread cookie. The pistachios add some nutty saltiness but not enough to dominate things. They actually enhance the whole product with their flavor as well as their texture. I feel like there are underlying tones of almond flavor and looking over the ingredients there are indeed almonds included inside the “pistachio paste”. I seriously can’t believe how much I'm enjoying this flavor. Verdict? I need to try more pistachio flavors asap. Recommendations? Buy Again? 100 times yes! Savory ice creams aren't uncommon. 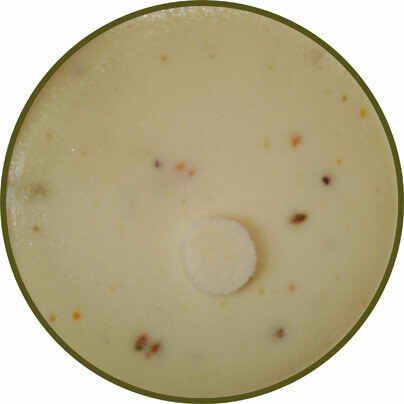 If you watch the Food Show Network's "Unique Sweets" you will discover that ice cream shops around the country make unique, savory ice creams that use herbs in their ice creams, such as sag and rosemary. One ice cream shop in Denver makes a Sour Cream and Chives ice cream and a Cream Corn ice cream, while the use of bacon is a common ingredient in many shops as well. There's a company that makes bone marrow ice cream. I'm just surprised that these trends haven't caught on with Edy's, B&J's, or Breyers yet. Try Ben and Jerry's version. @Stride, I know they aren't uncommon throughout the country. I meant along the lines of prepackaged products. Talenti has a Sicilian Pistachio gelato. I haven't tried it, but after reading this I think I might. @Sam: Ever since I tried Ciao Bella's I've been on the lookout for Talenti's version. I've yet to find it but I want to say I saw it a few months back at a store an hour away. I'll have to go look into that soon. @Stride, I'm not sure there's a big market for savory ice cream in grocery store type brands. Can you imagine what children would do if you brought home Breyer's bone marrow ice cream as their treat? If we are just talking about pistachio ice cream, "savory ice cream" is very, very common. 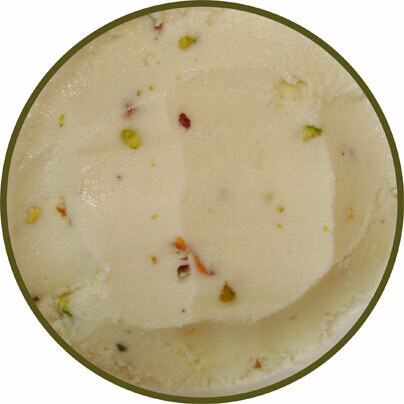 Pistachio has been an available flavor in ice cream shops all over the country for eons. My grandfather would go into grocery stores and ice cream shops expecting it to be there, and it always was. I can't remember a time when there hanb't been pistachio ice cream available to me either. I only have it from time to time, but yeah, it's just about being aware. This is an ice cream blog, right? If you hit Ctrl F, you can search a term. By doing so, you will find that pistachio ice cream was around as early as 1769. It was one of the 28 flavors widely available at Howard Johnson's, and by the fifties it was in their ten most popular flavors. There is even a version of Neapolitan ice cream that features pistachio. @mhann: you might want to re-read the review. at no point did nick say or imply that pistachio is a new flavor, it was merely his first time trying it. His point was that "savory" is a term rarely used in commercial ice cream. Go to the top of onsecondscoop.com and type in "savory" in the search box. Out of almost 900 reviews, the term only comes up once, and that's Nick's review. @Mhann: I was in no way implying that pistachio was a new flavor or that in general savory ice creams were new as well. I was saying that it was new to me since I've never tried pistachio ice cream or pistachios in general before. There is something more subtle than implication that can either be knowingly applied to one's writing or can unknowingly manifest itself; that thing is called tone. However unintentional it might be, the tone of the review is one of ignorance. Obviously, I wasn't the only one who thought so. Look back at stride4unit E's comment. As much as this blog contains a lot of good information about products, every now and then, it is evident that there are these weird little holes in you guys' knowledge. Fear not though. The competition has its problems as well. The Ice Cream Informant allows random guest reviewers to post snobby and sometimes wildly inaccurate assessments of certain flavors. As I recall, a fellow named Winston is at least somewhat dissatisfied with virtually everything he eats. I don't know how he gets up in the morning. There's a reason my twitter feed says "just a guy with a spoon". Never claim to be anything more. I still stand by my original point though. Try to find me a freezer aisle ice cream that has "savory" in it's description. It's just not something you find in mainstream (grocery store) ice cream, and that's what we cover here. @Mhann: I've said multiple times that I'm far from a writer. Heck, my degree is in business. I said that "I" haven't heard of an ice cream described as savory. I know they exist but not many of them are described as being savory. If you look at the descriptions for other pistachio flavors from Talenti, Haagen-Dazs and Ben & Jerry's, not one of them describes it as being savory at all. None even hint at it a little bit. I'm just saying it's uncommon to see a mass produced product to be described as being savory. Those cookies your grandma had were probably the Torrone nougat ones my Nona used to have around the house. They still have them at good italian shops. Also, Talenti is a bit better. I've had both, but Talenti has a stronger pistachio flavor. Rick, nope those aren't the cookies. They looked like your average butter cookies if I remember correctly but with more of a design to them I guess. Those torrone things looks pretty awesome though!